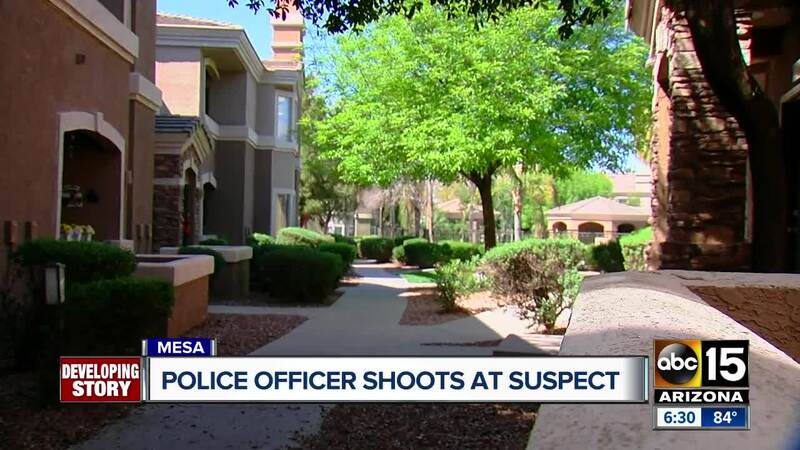 Concerned residents of a neighborhood in Mesa woke up to the sound of gunfire Monday morning after an officer was forced to shoot at a suspect. 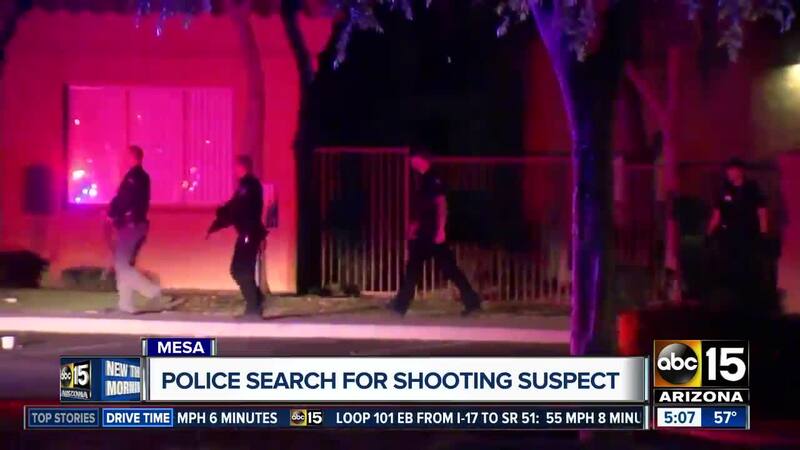 MESA, AZ — A suspect is in custody after a shooting involving Mesa officers early Monday morning. The Mesa Police Department said officers responded to an apartment complex near Baseline and Ellsworth roads just after midnight for a disturbing the peace call. Witnesses said a man had thrown a stroller into the pool and was acting erratically, possibly intoxicated or on drugs. Officers arrived to find a stroller and multiple scooters at the bottom of a community pool, according to a probable cause statement. Officers found a man matching the description of the person who threw the items into the pool in a parking area on the east side of the complex. While they were out with him, an officer saw a handgun tucked into his waistband in the small of his back. The officer tried to get control of the suspect, but he was able to break free. The suspect turned and reached toward his lower back, causing the officer to draw his weapon and fire. Officers recovered a 9 mm handgun from the sidewalk with a broken magazine and 18 rounds of ammunition scattered around. Police were present when the suspect called his girlfriend, who lives with him in the complex, and provided his phone coordinates and asked her to pick him up. Officers were able to take him into custody at that location, near the Loop 202 and Guadalupe Road. He was identified Monday afternoon as 23-year-old Ryan Coley Austin. 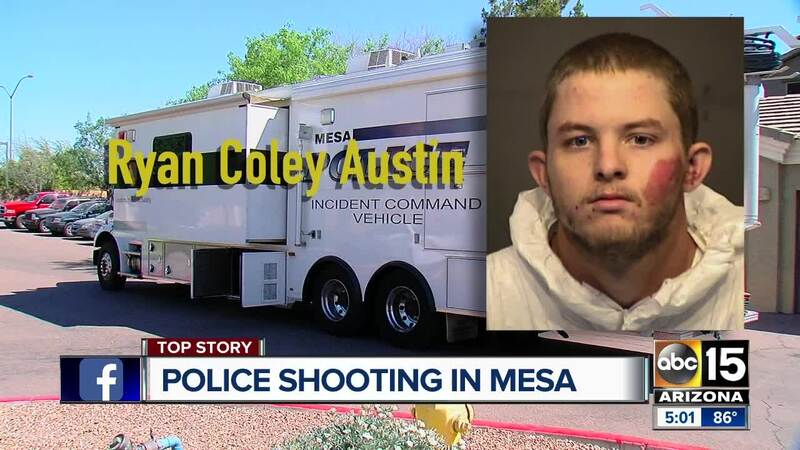 In an interview at headquarters, authorities say Austin admitted to having smoked marijuana all day and said he blacked out after being approached by Mesa police. Court paperwork says Austin was previously convicted of several felonies in South Carolina and prohibited from possessing a firearm. Austin was arrested and charged with aggravated assault with a deadly weapon, possession of a weapon by a prohibited person and 3rd degree burglary, among other charges.